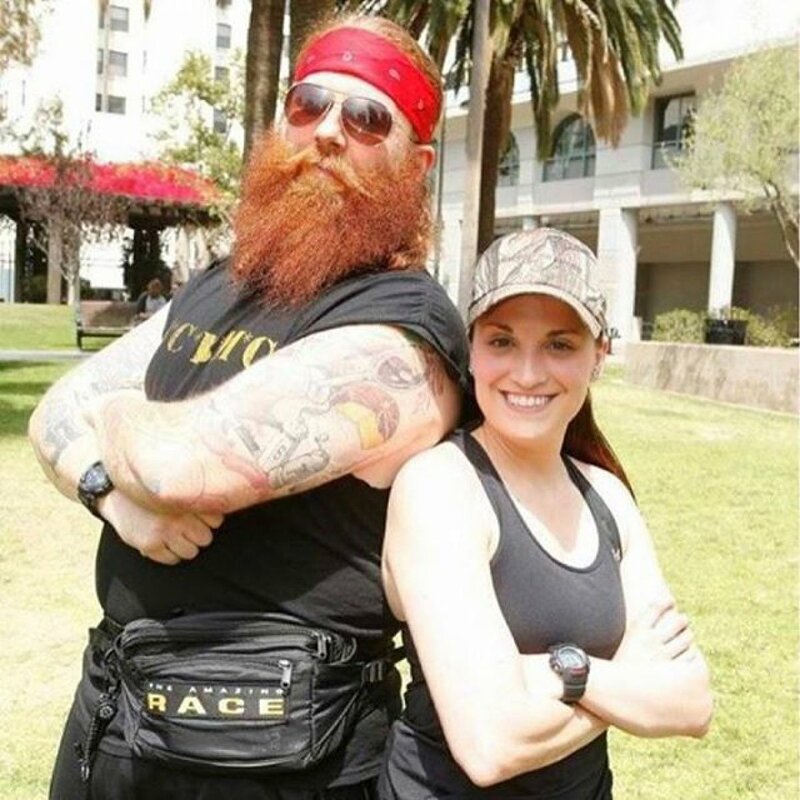 The Amazing Race eliminated Liz Espey and Michael Rado, who had survived two previous non-elimination legs, during Thursday night's Season 29 episode on CBS. Liz, a 24-year-old auctioneer from Maryville, MO, and Michael, a 37-year-old butcher from Pittsburgh, PA, were ousted from the around-the-world competition after they arrived at the eighth Pit Stop in Patra, Greece in sixth and last place. Michael joked that he fought with Liz during the Race like they were siblings, saying she had become a sister to him. "To be able to stand here on this mat and accept defeat with you -- it's been a real privilege," Liz said. "I'll be checking in on her -- snooping her Facebook page, making sure there's no creepers. Good race, kid," Michael added. The eighth leg kicked off last night in Venice Italy, with Matt Ladley, a 25-year-old pro snowboarder from Denver, CO, and Redmond Ramos, a 28-year-old former U.S. Navy corpsman from Murrieta, CA, ripping open the teams' first set of clues in first place at 11:15AM. The teams were instructed to travel to Patra, Greece. Becca Droz, a 26-year-old rock climbing instructor from Boulder, CO, and Floyd Pierce, a 21-year-old college drum major from Boulder, CO, departed the seventh Pit Stop in second place at 12:08PM. They were then followed by Tara Carr, a 38-year-old U.S. Army officer from Alexandria, VA, and Joey Covino, a 46-year-old police sergeant from Saugus, MA, at 12:28PM. Scott Flanary, a 34-year-old recruiting manager from West Hollywood, CA, and Brooke Camhi, a 36-year-old criminal attorney from New York, NY, were on their heels leaving at 1:01PM, and behind them were London Kaye, a 27-year-old artist from Brooklyn, NY, and Logan Bauer, a 27-year-old surgical consultant from Columbus, GA, at 1:02PM, and finally Liz and Michael departing at 1:11PM. When the teams jumped into taxis, Matt noted that he was getting along great with Redmond. Meanwhile, Becca and Floyd felt the same way, calling themselves the "Dream Team." London and Logan were also happy to report there was no drama between them. Liz, however, was worried about self-driving because the last time the teams were required to do so, she and Michael got into a huge fight. But Michael was optimistic, telling the cameras, "They're going to have to do more than a Speed Bump to get us out of here. We're not going home any time soon." All the teams then boarded the same charter flight to Bari, Italy. From there, The Amazing Race host Phil Keoghan explained the teams must take a 16-hour ferry ride across the Mediterranean Sea to Patra, Greece. On top of that, the teams would have to drive themselves 100 miles to the mountain village of Arahova, where a traditional Greek wedding awaited them -- and the Race's last Double U-Turn. Once the ferry docked, the teams ran into their cars. Everyone began crossing a large bridge en route to Arahova, but Becca and Floyd were a little confused driving in circles on secondary roads. Liz and Michael also missed a crucial right turn. As Liz and Michael watched most of the other teams turn the opposite way, tension heightened in the car. Michael snapped at Liz about reading the map, and then Liz suggested they just turn around. Michael, however, refused, saying he didn't want to backtrack and waste time. Liz insisted there was no other road, but Michael didn't seem to care. Meanwhile, Becca and Floyd found their way up the bridge and took the correct right turn. Tara and Joey arrived in the mountain town of Arahova in first place, and the team joined some locals dancing in what was a reenactment of a traditional Greek wedding. Matt and Redmond got there next, followed by Brooke and Scott. While Tara and Joey were still dancing waiting for their next clue, Brooke and Scott discovered the Double U-Turn board in first place. The team decided to U-Turn Michael and Liz as a strategic move -- nothing personal. Brooke and Scott kept apologizing to the cameras for putting Liz and Michael in this position. Once Tara and Joey spotted Brooke and Scott, they ran over to the board, as did Matt & Redmond. The boys quickly slipped in and announced they weren't going to U-Turn anybody. Tara and Joey then decided to U-Turn Becca and Floyd in order to give their friends, Liz and Michael, a fighting chance. Tara and Joey thought it was "so crappy" that Brooke and Scott had U-Turned their pals. The teams' next set of clues revealed they must complete one of two possible Detour tasks: "For the Bride" or "For the Groom." "For the Bride" required teams to deliver cans of sheep's milk on the back of a donkey through the streets to two cheese makers and then exchange the cans for lumps of specialty cheese. When they delivered the cheese to the bride, they'd receive their next clue. "For the Groom" required the teams to race with locals up 252 steps and find a shepherd, who'd give them a sheep or goat to deliver to the groom. Meanwhile, Becca and Floyd stopped to ask for directions to get onto the bridge. Becca said, "At least we're not a target for the U-Turn." And Liz and Michael, at this point, continued to drive aimlessly. Liz argued they were getting too far into the mountains and he should've let her turn around when she initially brought up the idea. Liz said they needed to go back the way they came, but Michael griped, "You don't know which way we came, because you can't read that map!" Michael said if they turned around and went all the way back, they'd be done. By this time, London and Logan had arrived at the U-Turn Board. Michael eventually conceded to turning around, and the team found the right turn they were supposed to take off the bridge. Michael and Liz then arrived at the U-Turn board in fifth place, learning their fate. Michael grunted, "Unbelievable!" The team was so surprised to have been U-Turned, especially by Brooke and Scott. "Thanks, Scott. Thanks, Brooke. That's real classy," Michael sniped. "I'm so glad, Brooke, that I helped you in Dar es Salaam when you couldn't finish your damn ladle!" Scott and Brooke had agreed not to U-Turn Liz and Michael after the pair helped them in the previous leg. "It was just so easy for them to lie to us," Michael added, "and to turn their backs on us. It was a slap in the face for sure." Becca and Floyd arrived at the Detour in last place. They had never expected to be U-Turned, thinking no one would view "Team Fun" as a big threat. Liz and Michael and Becca and Floyd therefore had to complete both tasks of the Detour. As for the other teams, everyone selected "For the Bride." The two teams ran into one another when they were delivering cheese, and so Michael realized his team was still in it. However, Liz and Michael didn't pay attention to the clue because they were each supposed to pick up a gift for the groom. As a result, they had to go back and get another goat. Tara and Joey completed the Detour in first place, and they were then followed by Matt and Redmond, Brooke and Scott, London and Logan, Liz and Michael, and finally Becca and Floyd. The teams then each smashed a plate and made their way to the Panathenaic Stadium Kallimarmaro in Athens. Tara and Joey arrived at the stadium, where the first modern Olympics was held in 1896, before any of the other teams. They were then followed by Matt and Redmond, and Brooke and Scott. Michael and Liz arrived at the stadium at the same time Becca and Floyd did, so Becca and Floyd were thrilled to see that the opposing team had a Speed Bump to complete at that location. Once inside the stadium, each team was instructed to complete a lap around the track in order to receive their next clue. For Michael and Liz's Speed Bump, they were required to prepare Kokoretsi by wrapping intestines around skewers of meat. They headed to a nearby food truck and Michael felt the task was right in his wheelhouse since they basically had to do the job of a butcher. Tara and Joey finished their lap in first place. On their heels were Matt and Redmond, Brooke and Scott, and London and Logan. Becca and Floyd then completed the run, followed by Michael and Liz. The teams then learned they must make their way on foot to a building called the Zappeion, and search for their next clue. Tara and Joey, once again, got to the Zappeion in first place. They were followed by Matt and Redmond, Brooke and Scott, London and Logan, Becca and Floyd, and finally Michael and Liz. The participating Racers had to master part of the changing of the guard ceremony at the Tomb of the Unknown Soldier. Tara opted to take on this task on behalf of her team as well as Brooke, Matt, London, Becca, and Liz. Tara, Brooke and Becca got rejected on their first try, but the task didn't turn out to be that hard. Tara and Joey finished the Roadblock before any of the other teams, while Scott and Brooke jumped ahead in second place. Matt and Redmond finished the Roadblock in third place, and they were followed by London and Logan. Becca and Floyd completed the Roadblock before Liz and Michael due to the Speed Bump. The teams' last set of clues for the leg sent them to the next Pit Stop at Areios Pagos, on the grounds of the Acropolis. Tara and Joey stepped on the Pit Stop mat and met Phil in first place. For winning the leg, they were each awarded $7,500. Matt and Redmond arrived in second place, followed by Brooke and Scott in third place. Explaining their decision to U-Turn Liz and Michael, Scott told Phil, "For us to stay in the game, we had to push someone further down. And for us, that was Mike and Liz. So it's a very hard decision, but we have to play the game." London and Logan made it to the Pit Stop in fourth place, their highest finish in the Race to date. Becca and Floyd then arrived, and they were both humbled and very grateful to still be in the Race. Liz and Michael soon learned their elimination fate when they stepped on the mat in sixth -- and last -- place.